I am a native Floridian, born and raised in Orlando. My love of music began in junior high school when I joined the marching band as a drummer. Through the years I have honed my skills as a drummer, latin percussionist and singer by performing with a variety of bands in many different venues, including Branson Missouri, where I was the headliner. Life has afforded me many opportunities, including becoming a Professorial Stunt man. Where I did some stunt work in films and television. I have performed in fight scenes, fire burns, High Falls off buildings and my all time favorite, stunt car and boat driving! However, I always come back to my true passion, music. I began playing the Double Tenor Steel Drums a little over 7 years ago. 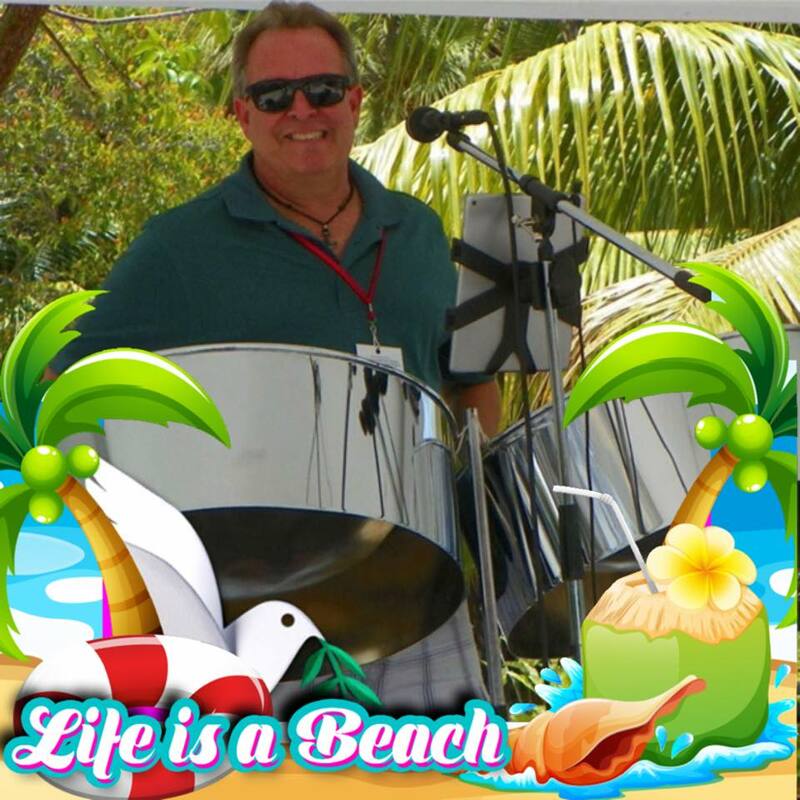 I play for Margaritaville at Universal Studios, Orlando and Hollywood Fl, multiple Bahama Breeze locations, as well as, several agencies including Bookit, Peyton and Tropical Music International, just to name a few. I perform for weddings, corporate events and private parties. In the last year I have become an approved musician for the Margaritaville Corporation and Daytona Latitude Margaritaville and Hilton Head Latitude Margaritaville, both Minto properties. I have played at the Grand Opening and several other events for both locations. I have been a member of The Trop Rock Music Association (TRMA) for the last 2 years. During this time I have been asked to play Pans on Six different albums, For Bill Cockrell, Cory Young, Donny Brewer, Reggie Starrett, Ty Thurman, and Jonas Lorence. One of them I recorded in Nashville, Tennessee with the some of the best musicians in the world…..musicians who tour and record for, Kenny Chesney, Brad Paisley and Brothers Osborn bands. I have also had the great pleasure of performing with Coral Reefer member, Doyle Grishem, Bill Cockrell,, Cory Young, Donny Brewer, Reggie Starrett, Ty Thurman, Jonas Lorence, Rudy Cox, James White, Mark mulligan, Kelly McGuire, Souther Draw Band, Don MiddleBrook, Thom Shepherd and Coley Mccabe Shephard, Melanie Howe, Jimmy Parrish, High Way 1 Band, and Many others….. I have performed at Many House concerts Including, The Habitat, Diablo Creek, and The Yard. At the Meeting Of the Minds, Trop Rocks annual “flocking” in Key West, I was Nominated 2018 Musician of the year for the TRMA. I also recently became a life long member ( Academy Member ) of the TRMA . I am available for bookings. You can reach out to me on Facebook or Personal Message, any time. I love what I do, and Love being part of the Trop Rock World. I thank God every day For this gift of music, the places and people it has brought into my life is an amazing Blessing. God Bless.